White mustard is an annual plant. The yellow flowers of the plant make seed pods, with each pod having a half dozen seeds. These seeds are harvested just before the pods become ripe. White mustard seeds are hard and round, usually around 1 to 1.5 millimetres, with a color forming from beige or yellow to light brown. In Greece, the plant's leaves can be eaten during the winter, before it blooms. Greeks call it vrouves or lapsana. The blooming season of this plant (February–March) is celebrated in the Mustard Festival. 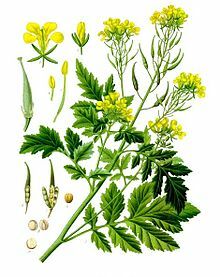 ↑ David T. Balke and Levente L. Diosady; "Rapid aqueous extraction of mucilage from whole white mustard seed"; Food Research International; June 2000; 33 (5): pp. 347-356. This page was last changed on 25 September 2014, at 14:26.